On this date in 1944, two days after the D-Day landings, a small piece of Nor­man­dy, France, became the site of the first Amer­i­can mili­tary ceme­tery to be estab­lished in Europe during World War II. On that first day the make­shift grave­yard near the village of Colle­ville-sur-Mer was lined with several rows of crosses each draped with a sol­dier’s dog tag. 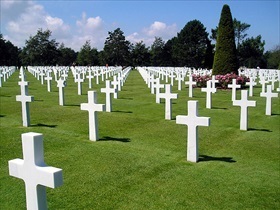 Bodies that had piled up on near­by Omaha Beach on June 6 now lay in neat rows ready for burial. A work detail of German POWs (among the first of 200,000 POWs) used two-wheel carts to bring the bodies up from the beaches to their new resting place—sec­tions that were iden­ti­fied by letters of the alpha­bet so that the work details could lay the bodies out by the last name (family name) on their dog tag. There were no coffins for the dead, just bed sacks tied at the end. After the war a permanent cemetery was estab­lished at Colle­ville not far from the origi­nal grave­yard. Also after the war the U.S. govern­ment gave rela­tives the option of leaving their loved ones in war graves in Europe or reburying them in America. The fami­lies of 60 per­cent of the 30,000 Amer­i­can soldiers killed during Oper­a­tion Over­lord chose to have the bodies of their loved ones repa­tri­ated. Sitting on a cliff over­looking Omaha Beach and the Eng­lish Chan­nel, the 172‑acre Nor­mandy Amer­i­can Ceme­tery and Memo­rial is laid out in the form of a Latin cross and con­tains the graves of 9,387 U.S. ser­vice mem­bers, average age 24, most of whom lost their lives in the D‑Day landings and ensuing oper­ations. Each gravestone points west, towards home. The memo­rial con­sists of a semi­circular colon­nade; in the center is a 22‑ft bronze statue, “Spirit of Amer­i­can Youth Rising from the Waves.” On the Walls of the Missing, in a semi­circular gar­den on the east side of the memo­rial, are inscribed 1,557 names of the men whose bodies were never recovered. In a chapel at the heart of the rows of dead are in­scribed these words: “Think not only upon those passing. Remem­ber the glory of their spirit.” Those interred in the Colle­ville ceme­tery are among the more than 93,000 World War II casual­ties buried over­seas, repre­senting roughly 23 percent of the 400,000 Americans who never returned home. Above: On a cliff over­looking Omaha Beach and the English Chan­nel and roughly 170 miles west of the French capital, Paris, is the Nor­man­dy Amer­i­can Ceme­tery and Memo­rial. Dedi­cated on July 18, 1956, the memo­rial con­sists of a semi­cir­cular colon­nade with a por­tico at each end. The porticos con­tain large maps and narra­tives of the mili­tary operations that lib­er­ated this part of France. In the colon­nade’s cen­ter is the 22‑ft bronze sta­tue “Spirit of Amer­i­can Youth Rising from the Waves.” It faces west toward the reflecting pool and head­stones beyond the pool. On the other side of the burial area is a cir­cular cha­pel; at the far end are two gra­nite statues, one repre­senting the United States, the other France. An orien­ta­tion table over­looking the beach depicts the Nor­mandy landings, the largest am­phib­i­ous in­va­sion of all time and the first step in the Allied liber­a­tion of France and the rest of North­west Europe. Opened in May 2007, a $30 mil­lion visitor center con­tinues the story of the 9,387 Amer­i­cans buried there and puts the D‑Day landings and follow-on battles in Europe in perspective. 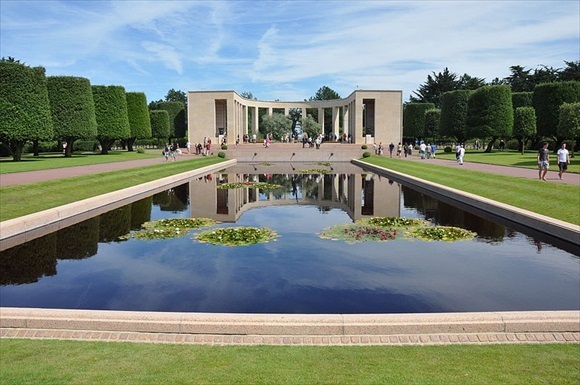 The Normandy Amer­ican Cemetery and Memorial receives over one million visitors each year. Left: A central mall bisects the ceme­tery’s ten burial plots. The fallen service­men and women lie beneath pre­cisely aligned head­stones of white Lasa marble Latin crosses (9,238) and Stars of David (149). A French couple founded Les Fleurs de la Memoire (Flowers of Memory), an organi­za­tion that encourages French fami­lies to put flowers on the graves of the soldiers buried at the Amer­i­can Ceme­tery and Memo­rial. As of August 2011, 8,500 graves had been adopted, the numbers growing by the year. Right: On a series of wall-mounted tablets in the semi­cir­cular Gar­den of the Missing on the east side of the memo­rial are inscribed 1,557 names of those who went missing in action in this region of France. A bronze rosette next to a name indi­cates that the remains were later recovered, identified, and buried. Above: La Cambe German War Cemetery is the largest of six Ger­man ceme­teries in Nor­man­dy. 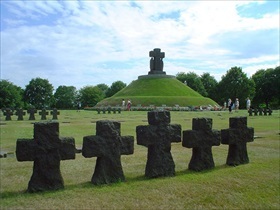 Located close to Bayeux, France, it con­tains the remains of 12,000 Ger­man sol­diers who were moved in from 1,400 loca­tions in the French depart­ments of Calvados and the Orne. Since La Cambe’s inau­gu­ra­tion in Septem­ber 1961, the remains of over 700 more sol­diers, scattered on battle­fields across Nor­man­dy, have been rein­terred at La Cambe. A large tumu­lus, or mound of earth and stones, marks the resting place for 207 un­known and 89 iden­ti­fied Ger­man soldiers interred together in a mass grave. Topped by a large dark cross in basalt lava, the tumu­lus is sur­rounded by 49 rectangular grave fields with up to 400 graves each. 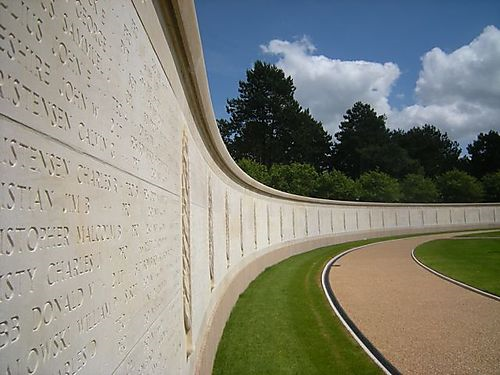 Left: Located in Bayeux, Normandy, the Bayeux War Ceme­tery is the largest World War II ceme­tery of British Com­mon­wealth sol­diers in France. The ceme­tery contains 4,648 burials, mostly of the Nor­man­dy in­va­sion. 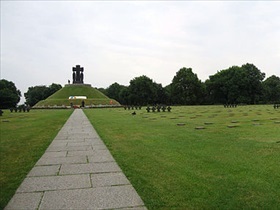 In addi­tion to the Common­wealth burials, there are 466 graves of German soldiers. 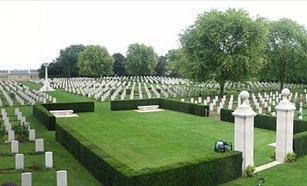 Right: The Bény-sur-Mer Canadian War Cemetery contains pre­domi­nantly Cana­dian soldiers killed during the early stages of the Battle of Nor­man­dy. 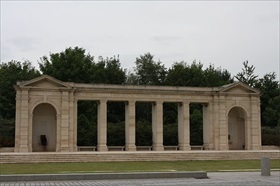 The ceme­tery is located in and named after a com­mune in the Calvados (Lower Nor­man­dy) depart­ment, near Caen, the site of fierce fighting by British and Cana­dian troops. Cana­dian soldiers killed later in the Battle of Nor­mandy are buried south of Caen in the Brette­ville-sur-Laize Cana­dian War Ceme­tery located in Cintheaux, between Caen and Falaise in Lower Normandy.